American Flag raised by Marines at Iwo Jima Memorial. While many Americans take it for granted that our nation will always be strong as we approach the July 4th celebration, the Founding Fathers who signed the Declaration of Independence felt otherwise. They recognized that the struggle for independence would be tortuous and the outcome was highly uncertain. Benjamin Franklin even joked about it: “We must all hang together, or we will surely hang separately.” Only about one-third of the colonists actively supported independence. Some members of the Continental Congress – including the respected John Dickinson of Pennsylvania – refused to sign the Declaration, feeling the move would lead to ruin. Dickinson is a good example of how principled, intelligent people had serious doubts about the direction our nation should take. Alexander Hamilton by John Trumbull (1806). One man would lead the way. Alexander Hamilton came from a poor family in the West Indies. His father abandoned him when he was 10; his mother died a year later. From turmoil, he built his strength, working as an apprentice in a trading house. When the owner left for several months, Hamilton was granted authority over the entire operation, handling hundreds of ships carrying cargoes from around the world. Learning the complexities of international trade, finance, currency exchange, commodities, personnel and inventory management, he became a master of these disciplines by the age of 15. After emigrating to the colonies and fighting for “the cause,” he served as George Washington’s most trusted aide-de-camp, participating in the final victory at Yorktown. Although America won the war, the nation was basically a collection of independent states, held together loosely by the ineffective Articles of Confederation. We were also bankrupt, with tens of millions of dollars in debt, upon which the nation defaulted as it struggled to gain its footing. By the mid-1780s, it was clear the experiment in self-rule would end in failure without drastic changes. Congress needed more authority to make laws for all the states and levy taxes to pay its bills. As colonists had just fought a bloody war against a monarchy doing just that, the debate over a new direction was furious. Of all the delegates at the Constitutional Convention of 1787, Hamilton was the only one who’d written eloquently about independence, put his life on the line to defend it and outlined a detailed plan to save the republic from disaster. Hamilton’s numerous recommendations made their way into the final draft of the U.S. Constitution, where he detailed the powers of a central government to tax, regulate commerce, coin money, issue debt and other functions critical to the survival of any government. His words -- embodied in Article I, Section 8 -- were the lifeblood of the Constitution and the saving grace for our nation. Washington thought so highly of him, he made Hamilton Secretary of the Treasury. 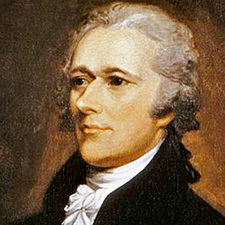 Despite repeated protests about his policies from Thomas Jefferson and others, Hamilton’s proposals became the cornerstones of our financial and economic system. Yet his warning against excessive debt was one lesson our nation didn’t seem to learn in the centuries that followed. Forty years after this raucous debate, the last surviving signer of the Declaration, Charles Carroll, helped start another series of changes. On July 4, 1828, Carroll laid the cornerstone for the Baltimore and Ohio, the country’s first railroad. Combined with steamships and the telegraph, two new revolutions in transportation and communications transformed America. The republic was thriving, blessed with fertile soils, swift-flowing rivers and seemingly endless natural resources. Businesses expanded as the country now had a banking system, a stable currency, free flow of capital and public securities markets, all of which supported robust industrial expansion. Hamilton’s ideas triumphed over those of his detractors, including Jefferson, who hated banks and distrusted business. Yet the biggest test of all was still ahead, as a “peculiar institution” moved the nation to its breaking point. 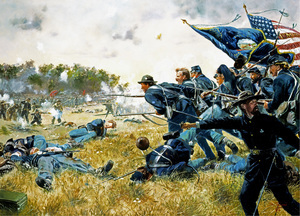 First Minnesota at Gettysburg, painted by Don Troiani. By the 1850s, America had been through financial panics and a war with Mexico, the latter of which caused an enormous expansion of territory and even more heated debates. Slavery existed widely in the southern states, but was largely absent in the North due to its more diversified economy. Plantation owners viewed slaves as essential to their way of life; abolitionists considered the practice an abomination. Despite a series of compromises, politicians failed to resolve the issue as slavery spread to western regions. Weeks after the election of President Abraham Lincoln, South Carolina seceded. A few months later, rebels fired the first shots in a conflict that nearly destroyed America. The Civil War claimed two percent of the population, more lives than all other U.S. wars. Today the equivalent casualties would number an unthinkable six million people. The South’s economic base was demolished, but the North rebounded strongly. By 1895, the output of New York State alone was equal to that of all the southern states combined. The Confederacy ended in dismal failure, with distress for tens of millions of people, generating deep wounds that would take over a century to heal. America was again resilient, experiencing vigorous economic growth from the late 1870s through the early 20th century (with some financial downturns), placing it in the top tier of industrialized nations. In 1913 the country got a fully functioning, modern central bank with the Federal Reserve System, which took up its duties just in time for another calamity -- the Great Depression. We struggled for more than a decade through our worst financial catastrophe. Only after a ramp-up in industrial activity during World War II did the country rebound back to prosperity. We saw more challenges in the following years: The assassination of a President, his brother and a major civil rights leader, a controversial war, a savings and loan crisis and the implosion of the real estate market. Government gained more powers to guide the ship of state, expanding its footprint into almost every aspect of our daily lives. While we were rescued from drowning, some people wonder whether the rights our soldiers fought for through several wars have been transferred from individuals … to the government. What would the founders think of America today? Surely they’d be impressed with the advances in technology, but also likely be stunned by the transformation of our way of life. Washington warned that only a virtuous people could survive as a nation. Jefferson argued that a republic couldn’t function unless its citizens were educated, well-informed on the issues of the day, and actively involved in their government. Madison felt a system of checks and balances was critical in preventing one group from gaining too much power. Hamilton recognized that the entire system would collapse if it could not generate revenue. Each of them had doubts regarding the longevity of this idea we call America, knowing that it would face unending challenges to its existence. Despite its many problems, our nation is still the envy of the world, evidenced by the millions of people who try to come here (legally and illegally) every year. What are they coming for? The same things the Founding Fathers fought to build: A stable government that respects human rights and a chance at a better life, with personal freedoms and the opportunity for success. With all the uncertainties, America’s future remains bright. It is up to us -- here and now -- to make sure that this experiment continues successfully for many generations to come. So Happy 240th Birthday, America! Long may the flag wave. Gene Pisasale is an historian, author and lecturer based in Kennett Square. He’s written nine books focusing largely on the history of the Philadelphia and mid-Atlantic region. His latest program is as a “Living Biographer,” portraying Colonel Alexander Hamilton. His website is www.GenePisasale.com.